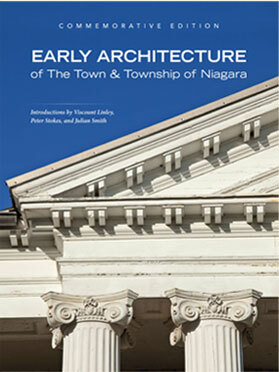 Early Architecture of the Town and Township of Niagara was first published in 1967 by The Niagara Foundation. A subsequent paperback “student edition” was also printed. The current Board of Directors decided that the important bicentennial celebration of the War of 1812, coinciding with the 50th anniversary of The Niagara Foundation presented a unique opportunity to update and "bring to life” the detail in the original publication. We are grateful that Dr. Peter Stokes, the noted restoration architect, was again able to assist The Niagara Foundation in this endeavor as he did with the original publication. That volume had been assembled in conjunction with the National Survey of Buildings in which he played a prominent part. This new book aims to bring that technical documentation to life by marrying the recorded interior and exterior detail to the living historical examples to which they relate through contemporary photographs of these extraordinary heritage properties. In so doing this volume is not only an academic resource for students of heritage and architecture, but also an invaluable reference for enthusiasts of the early history of the Town. Virtually all of the architectural details in the book are from structures which emerged following the burning of the town in 1813. The exquisite detail on the pages that follow provides a template for future restoration to maintain this history. It is evident from these photographs and drawings, that even then "God was in the detail”.